After a solid start to the World Cup Series in Albstadt, Germany, the Scottish cycling mountain bike squad drove 7 hours due east to Nove Mesto an Morave in the Czech Rep. Leaving european Germany and finding ourselves in the Czech Rep was like taking a backwards leap in time and felt more like Russia than a stones throw from the German border. A beautiful country with rolling wooded hillsides and smiling people, the Czech rep became the perfect place for us to come down off the highs of one race and prepare for another. 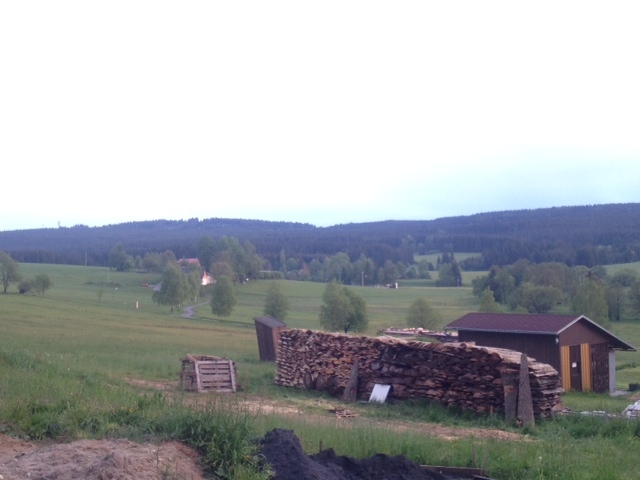 Our accommodation for the week was a hunting/ skiing lodge near the ski area of Nove Mesto. The interior boasted of our hosts considerable hunting prowess with most wall and floor space covered with the evidence. But we soon made it our own with 4 people’s worth of dirty bike kit. With no wifi, Rab was like a caged animal but we managed him as best we could. We spent the week recovering, bike fettling and, later, course training. The event arena was a 20 minute spin away on lovely smooth single track roads so we would ride out together for a couple of laps of the best course on the circuit. Nove Mesto is steeply wooded and rooty with some showcase rock features and a Tarmac road section through the packed event arena. A good mountain biker will carry speed and make time despite their strength and fitness on the course. Which is just as well considering what happened on race day. My race was at 11.30. We drove down to the GB pits where I rolled out on course to get a feel for my bike before returning and jumping on the turbo for a warm up. But part way through my warm up my heart rate monitor failed and I was left trying to judge how good a warm up I had had. Things like that are small in the bigger picture but they really throw you in a high pressure environment like a World Cup. Still, I got to the start line and was gridded with the rest of the field. I felt pretty strong and positive about this race and with my current form thought i could do well despite my poor warm up. This feeling was reinforced after the gun had gone and I had moved up 20 places on the Tarmac sprint. Then someone’s bar caught mine and we were both sent in a sickening cacophony of carbon on concrete into a barrier. I was least worse off so got back on and tried to get back to the lead group but as soon as I hit the hill I knew it was not going to be my day. It’s difficult to pinpoint why. My breathing was ragged and my legs were leaden but i hoped this was as a result of my poor warm up and that I’d ride into form once the race settled a bit. This never happened. With rasping lungs and screaming legs it was all I could do to just keep riding. I felt like I was going backwards on all the climbs so I just kept my head up and tried to maintain as much speed as possible on the descents in the hope I could complete the race. I found my flow but the climbs were still not happening and with one lap to go I was the first pulled from the race and placed 47th. Not what I hoped for or expected but it can’t always be your day on race day. It is now recovery Monday. We spent last night in a converted 10th century monastery in Prague and today Rab and I have been wandering the streets and eating bad things. We look and sound about 20 years older than ourselves with our hacking coughs and shuffling gaits. The epitome of athleticism. Soon we fly home and prepare for the 3rd round of the national series in Shropshire. Not quite ready for that yet but hopefully by Sunday I ll have sorted out the learning to be had from these World Cups and be feeling strong and fit from their training effects. Might need a bit of Tweedlove to get me in the mood.